And I shouldn't admit to the reason why, but I will. As if there's anything I wouldn't tell you guys at this point. I'm not writing a post because I want to play Pokemon on my old Nintendo DS. Go ahead, judge. I'm owning this choice. Look, I'm trying to level up some grass-types, and it's weighing on my mind, OK? There are all sorts of things I could be doing to relieve stress. 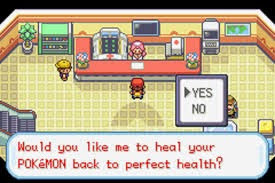 I'm choosing to play Pokemon. Tomorrow I'll write something. That relieves stress, too. Never played it, but go right ahead. I mean, I de stress to Russian hard rock, so who am I to judge, right. I'm more of a fire type myself. Love me some Charmander! Hey, my greatest way of relieving stress used to be pinball. It had the added bonus of getting me out of the house or office to go to wherever the pinball machines were. And when I was out of quarters it was time to go back to pretending to be a useful part of society. Now I have a pinball game for my Wii that has faithfully recreated some of my favorite tables. I have to set an alarm clock to remind me to turn it off and go back to being a useful part of society. I used to feel guilty about having brainless fun. I don't feel guilty anymore. It might be because the brainless fun has melted my brain entirely. Or it might be because everyone needs to occupy themselves with a diverse and well-rounded assortment of activities! Gotta catch 'em all. Word.